Camiguin de Babuyanes is an active stratovolcano on Camiguin Island, part of the Babuyan Islands group that is located in Luzon Strait, north of the island of Luzon, in the Philippines. The volcano and the island is within the jurisdiction of the municipality of Calayan, in the province of Cagayan. The well-forested Mount Camiguin or Camiguin de Babuyanes, to distinguish it from Camiguin of Mindanao, has an elevation of 712 metres (2,336 ft) asl, and a base diameter of 3,200 metres (10,500 ft). It occupies the SW tip of 22 km (14 mi) long Camiguin Island. Fumaroles are found on the southwest, west, and east flanks of the volcano and a boiling spring is located near sea level on the western flank of the volcano (magas-asok). The Philippine Institute of Volcanology and Seismology (PHILVOCS) lists Camiguin de Babuyanes as one of the active volcanoes in the Philippines. All volcanoes in the Philippines are part of the Pacific ring of fire. An eruption was recorded around 1857. It was reported as phreatic and possibly partly submarine. In 1991, there were reports of volcanic activity but instrumental investigations showed no sign of unusual volcanic activity, such as intense fumarolic activity, felt earthquakes, fissuring at the volcano’s slopes, or smell of sulphur. Another report of volcanic unrest was reported in 1993 but an aerial survey of the volcano proved no signs of activity. Formation of the island started during the Pliocene era with an andesitic volcano, followed by the subsidiary cones of Minabel to the north and Caanoan in the eastern part of the island. 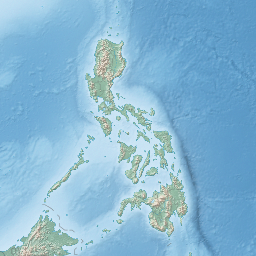 The southern part of the island consists of three volcanic centers located traversing a SSE-NNW line, Mount Camiguin stratovolcano and the young andesitic lava domes of Mts. Malabsing and Pamoctan. ^ a b "Camiguin de Babuyanes". Global Volcanism Program. Smithsonian Institution. ^ "Camiguin de Babuyanes Archived 2011-09-01 at the Wayback Machine". Philippine Institute of Volcanology and Seismology (PHILVOCS). Retrieved on 2010-10-13.